I'm glad you stopped by to check out my body of work here at studioKathome, where there is "a 'lil bit of everything". My photography can range from strong patterns, to bold colors that bring impact, to the simplicity of black & white. My innovated alternative techniques and processes bring a different perspective to the ordinary. My goal is to bring to you unique imagery that sometimes can be overlooked in the details of this ever changing world. The image was taken in the Historical city of Charleston, SC. The bikes that are scattered along the streets are represenative of the charm this city exudes. As a photographer, I have fallen in love with this city. It's full of textures, color, and repetition. I love to capture what some may walk by, and see just a row of bikes. 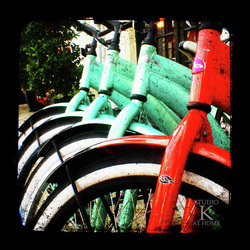 I found the constrast in the colors, repetition of the bikes in a row luriung me to capture their charm, and using my ttv camera I was able to add a touch texture! My shop on ESTY will be carrying photo-related products soon. Scrabble® tile pendants, TTV notecard stationary, and much more! Just in time for the holidays! All artwork, selected photography, designs, images, written material or text, on this website are Copyright protected. Any infringement, use, reproduction or storage of the materials contained within this site without expressed written consent from Kendra Portnova is a violation of the law and enforceable by International Copyright Law.